My anchor watch was 5.30am to 6.30am – result! I got a whole nights’ sleep. Brian, on the other hand, had to sleep in the sail locker as I needed my bunk. He said it was comfortable, although I have my doubts! The batteries that make the lights etc work seemed to be a bit low, so we had to switch on the engines to top them up. Early wake up call for everyone! We seemed to have ran out of water again, so I cleaned my teeth in salt water. Yuk!! After breakfast we had to do some towing exercises. We had to tow the Telemed boat, and then they had to tow us. After a few futile attempts to get the towing line over to them with buoys attached, we finally managed it with the throw rope. They had a very serious American on the radio, who sounded just like the man from NASA. When the first couple of attempts to get the line over to them failed, we half expected to hear “Houston, we have a problem” come over the radio. Not sure if they could hear the laughter coming from our boat after their broadcasts, or the slightly dodgy responses, but they didn’t let on. We had to tow for half an hour and be towed for half an hour. All in lovely calm waters – no problem at all! For the last afternoon we put the spinnaker up for the final time – and with the amount of wind we nearly made it across to France! Only trouble was we had to come all the way back again at nowhere near the same speed. It took ages to get back. We then had to practice a search pattern with all the other boats. “Someone” had gone overboard and was lost, and we all had to operate a search pattern to find them. We were doing the two minutes one way, change direction by 20 degrees going two minutes the other, with all hands on deck looking over the rails spotting. We spotted the dan buoy after about twenty minutes, and went to retrieve it. Apparently, there was something else overboard too. Just we were motoring to our anchor spot, Wendy saw some broccoli in the water with wool around it. That was it! Who would have thought, with the whole of the ocean to get lost in, that a small head of broccoli would be rescued. We must have got a gold star for that!! John tried out his drysuit to rescue it – and it worked. At least he doesn’t have to wait for the real thing to discover it doesn’t have a leak. It was my turn for dinner again tonight – and in the calm of Stokes Bay I had none of the throwing up in the washing up water mularky that I had last time. Everything went perfectly to plan. My anchor watch was 10pm to 11pm – and then another night’s sleep. And Brian was in the sail locker again!! The day started at midnight again – and the good news was we had passed three other boats during the last shift. The bad news was the wind had got up, the seas were rougher and the boat was heeling at 45 degrees. That feel good feeling didn’t last long then! We (again the royal we) changed a head sail. In this wind!! Linda fell out of the companionway with the sail bag and badly bruised her wrist and ribs. I sat with her on deck for the rest of the shift and tried to keep her mind off it. Her wrist was swollen quite badly, and at this point we didn’t know if it was broken or not. Cheryl is a physio, and she thought there was only soft tissue damage. We got Linda down below decks and into her bunk, so at least she could rest in comparative comfort. I climbed into my bunk at 4.30am – another short sleep then! When I woke up at 6am for the next shift, I had to pull myself out of the cave locker – the boat was heeling the other way round, so I was lying against the wall and the lockers. Good job I have a fat backside – it was probably that that stopped me going in totally! I helmed for a lot of this shift – at least there is something to hang on to. I quite like that job – it is like being in a little cage, and I have a sense of safety. Even Rowena, who is older than me but much fitter, seems to have developed a soft spot for me seems to want to take me under her wing. Obviously likes the underdog! I seem to do so much better when the boat is the right way up. Phil didn’t make it up on deck this shift – he took it upon himself to deep clean the whole of the below decks. I was very impressed. I heard afterwards that there had been a few comments about the cleanliness of the toilets when we went off shift from the other watch. I hadn’t heard anything – but then most things go over my head! Whilst he was down below we put the spinnaker up and got a good move on! The 2pm to 6pm saw the finish of the second race, and we came a very close 3rd place. We had a tousle with Team Olivier and it could have been either of us. We heard later that Olivier had “let us beat him” – typical French attitude!! We beat him fair and square. It was a good finish though, with a lot of good banter going between the boats. We then did another transfer between boats – this time for real. We had ran out of water – apparently we weren’t supposed to use it for washing up, so we had gone through our limited supply too quickly. The other boat had ran out of tea bags. We didn’t have that many tea bags left, so we put some green tea bags in to make up the numbers. When we got the water back, they sent the green tea back as well. Obviously no green tea lovers on that boat then! We anchored at Stokes Bay, where we had an “Abandon Ship” drill. Hope we never have to do that for real! We used the makeshift funnel to get the water into the tanks again, and had a group debrief over dinner. It was a general consensus that heeling is the pits! Today started at 3am – late compared to the last couple! I tried climbing down the wall to get out this time – just about managed it without becoming a heap on the floor. We had a beautiful sunrise, and finished the race during this shift. 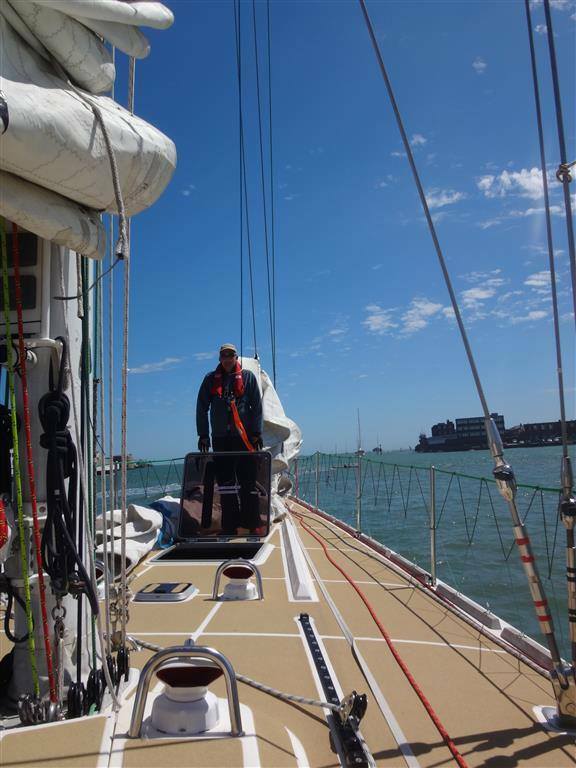 We had been over to France, round a waypoint, over to Devon somewhere and back to just off Gosport. We were around 5th I think – because of the flappy sail perhaps! Diane’s Telemed boat had managed to get a lobster pot caught around the rudder, and we apparently had had an emergency call to go and help out, but they had freed it before we got there. Actually went to bed on the flat – weird. I still tilted my bunk and pulled the lee cloth tight – you never know when it is going to start again! At 10am we got ready and started another race. This time it was a normal start, and we had a good start again. We headed off around the Isle of Wight, and it was obvious to see how tactics play a part in the race. One boat went very close to the shore, and several went further out. Tides and wind play a part, and the one close to the shore went far ahead. 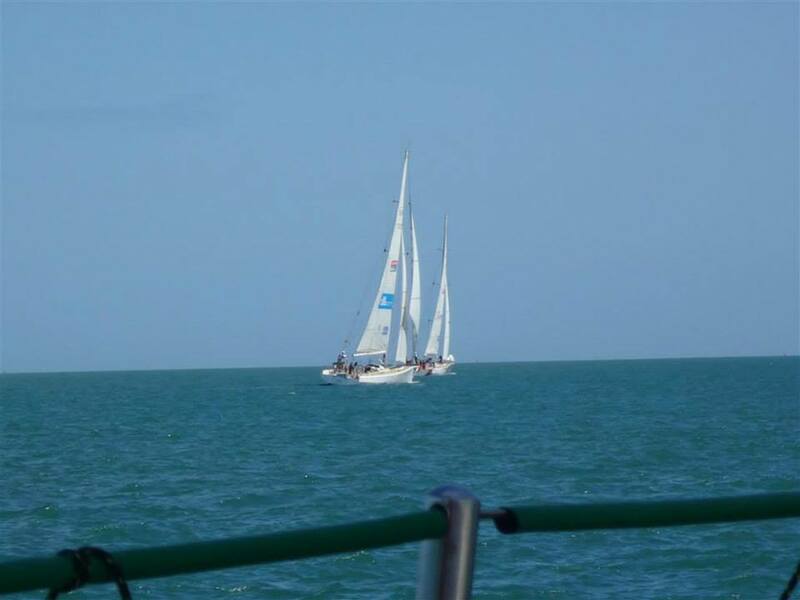 This is lovely sailing – flat, calm and a lovely sunny day! Then we hit a “hole” in the wind and stopped dead. The others just sailed passed. That’s life! Both Daniel and Wendy had climbed up on the boom to try and put the baton back in the sail – not something I will be doing anytime soon. Neither one could do it – so they both got up and one pushed and one pulled. I had scenes of them both falling into the sea and not having anyone to run the boat in my head. It was certainly a very risky manoeuvre! But, it went in, they both came back down safe and sound, and hopefully it will make the boat go faster. The 6pm to 9pm shift came, and we were still almost stationery. I said “Good Morning” to Felipe, who is in the bunk above me, whenever we got up – doesn’t seem right to say anything else. And it takes me a while to get my head around what time of the day or night it actually is. He said he was really pleased to see my smiling face whenever he got up – it helped him when he was feeling not so good. My good deed for the trip! There were huge jellyfish all around the boat – apparently there is an infestation around these waters – but the jellyfish seemed to be going faster than we were! I have my appetite back, and life is good. The wind got up a little, and we actually passed one of the other boats. This I can manage! We had to put the emergency water in the water tanks, as we had ran out. This was when we discovered we didn’t have a funnel. Someone had obviously got a Blue Peter Badge, and made one out of a squash bottle. Excellent! My watch started at midnight to 3am – and we were still on the same level of degree. I could just roll out of the bunk (not literally, as I would have hit the floor and the wall) – I got a system where I could hold onto the bottom of the cave locker and just let the bottom half of my body slide out. My feet eventually hit the wall. Luckily, I only had my smock and my life jacket to put on. We got up on deck, to a very flappy main sail. A wooden baton that I didn’t even know the sail had, had come out. This was slowing us down a little. The stars were out in force though, so at least I had a good view. Phil had fallen out of a top bunk during the night – luckily he had not done too much damage. I don’t want to do that!! After getting another shove into my bunk at 3am, the next shift started at 6am. It had got a little rough whilst I was asleep, so I didn’t feel that good. Apparently there are four things that make you feel sick – rough weather, lack of sleep, spicy food and other people being sick, any one or a combination of any will do it. I think it is mainly the lack of sleep doing it for me – I am used to getting a good eight hours! Several others were in the same boat, so to speak, and some didn’t make it up for the watch. And we were still heeling at the same degree. This is getting boring!! For the 2pm to 6pm shift it was still heeling. Will I ever get used to getting around at that angle? I don’t think so. I was chatting to one very capable crew member, who said that if this had happened on the Level One training, he would have used his “Get out of jail free card” and pulled out. Too late now! Several were still not feeling their best, but we managed to get the spinnaker up. It didn’t go up properly, so it came straight down again. Then it had to be taken down below and “woolled”. Oh how I remember it well! It was my turn for dinner tonight, so I had to be up at 8pm to start it. Only two hours sleep then. Getting better and better. We did pasta and meatballs – and there was loads as several people (including myself) declined. The off watch had dinner first, but the on watch didn’t finish at 9pm as the sails had to be changed as the weather had declined further. It was 11pm before they came down – and I had been in the hot galley all that time feeling icky. As I was clearing up nearing midnight, and just taken the last plate out of the washing up sink, I threw up into the washing up water. Oh my god – I hope nobody saw that. Health and safety and all that – not allowed to spit after cleaning teeth into the galley sink so not sure how that might have been taken. I anti-bac’d and cleaned up, so hopefully nobody is any the wiser. Good job I didn’t partake in proper food! Tried climbing up the wall to get into my bunk, but my legs just aren’t long enough. Just managed to get in on my own, so either I am getting better or the boat has flattened a little. Too tired to decide which! Even an earlier start to the day today, as my anchor watch involved sleep, getting up and then going back to sleep again. My anchor watch was 12.30am to 1.30am. One from our crew, and one from Dan’s crew staggered, so I was on with Paul from 12.30am to 1am and then Gary from 1am to 1.30am. The moon was full and beautiful. We were anchored off Osborne Bay, as were the other six boats. Peace and tranquillity all around – for now! Because of the tide, we were now facing the opposite way to the way we had “parked” before I went to bed – that confused me slightly! When I got up for the second time today it was raining and horrible – Great British weather! A good day to try out the foul weather gear. With all the grumbles coming from the ladies about their design, I was mighty glad I went back and got the male version. I also stuck with “large”. I wanted to order medium several months ago, thinking that my diet would have kicked in well and proper before race start, and large would be just too large. Paul persuaded me to stick with large – he knows me too well. The top is a smock variety this year, and quite difficult to get over the head as there is rubber seals at the bottom, top and at the end of each sleeve. The large size was perfect to wriggle in and out of. I have lost a little weight – but nowhere near the amount I had planned to. Same old, same old! We had bacon rolls for breakfast – excellent start to the day. Or excellent second start to the day. We have several manoeuvres we haven’t yet practised to get through this week, and the first was a transfer of goods from one boat to another. We received some homemade flapjacks in the flare box that was thrown over, so it was decided that we ought to send my Nanaimo bars in return. They only got a few! This transfer is used when one boat runs out of something, or one boat has a spare that another boat requires. Seemed to go quite well when we were both standing still and the water is calm! We then did a couple of practice race starts – one Le Mans and one normal. 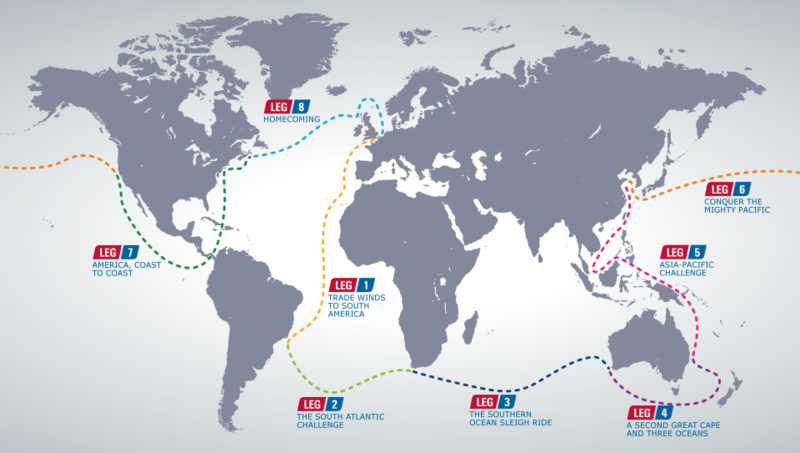 The Le Mans involves the Clipper Committee Boat in the middle of a line of all the other boats, all going at the same speed with their engine on, and only the main sail up. At the end of the one minute warning the engines are turned off, and everyone who has to be behind the coffee grinders runs forward to get the head sails up. The first one Daniel decided to give the engine a little throttle before turning it off – this was noticed and we all had to do it again! No cheating allowed!! We got away cleanly the second time, and we (that is the royal we) were quite quick at getting the sails up. Needless to say, the jobs involved here either required strength or speed so I was one the ones without a job. We then did a normal race start, having to go through two points after the gun had gone off. We did that one alright too. 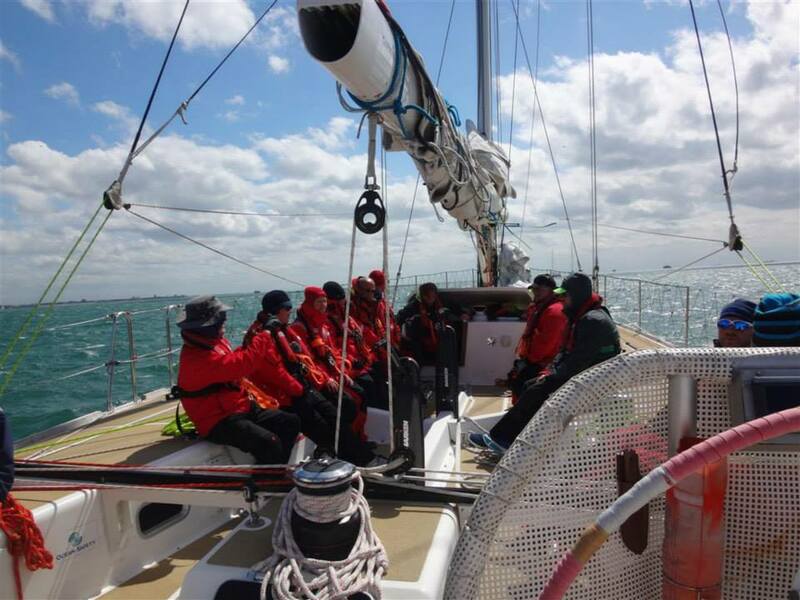 We then did a Le Mans race start for real – the skippers had been given some race co-ordinates a few minutes earlier, and we were in a real race situation. We set off very well, and managed to lead at one point. Off to France!! One of the boats pulled out – we later heard that someone had spiked their hand and had to be taken back for medical treatment. Dangerous sport!! We then started our watch system – 3 hours on 3 hours off during the night, and 4 hours on 4 hours off during the day. One watch would be lucky and get two lots of four hours sleep a day, and the other would get only one. But this would change day to day. We split into our respective teams at this point, and Team Wendy had the 6pm – 9pm watch to start with. We were sailing upwind from this point, and so the boat was heeling at a 45 degree angle constantly. At 9pm it was time to go below deck to get some sleep. Getting down from the deck was an issue, the ladder was not in a straight line with your body. Your body wanted to hang into thin air – not a good idea. Once you were down there, I then had to grab onto things to climb up to the side of the boat where I was sleeping. The life jacket and the smock came off – but the foulies and the boots were staying on. It was just too difficult – and this was just in the English Channel. Try as I might, I could not get into my bunk. Gary was passing, so I quite politely asked if he could unceremoniously make sure my body got in the bunk. He obliged! The bunk had to be tilted at quite an angle, and the lee-cloth pulled tight to stop me from falling out. Oh what joy! Brian had a top bunk that he couldn’t get into, so when I got out he got in. Team work! An early start today – unusually for training it was a 9.00am start. 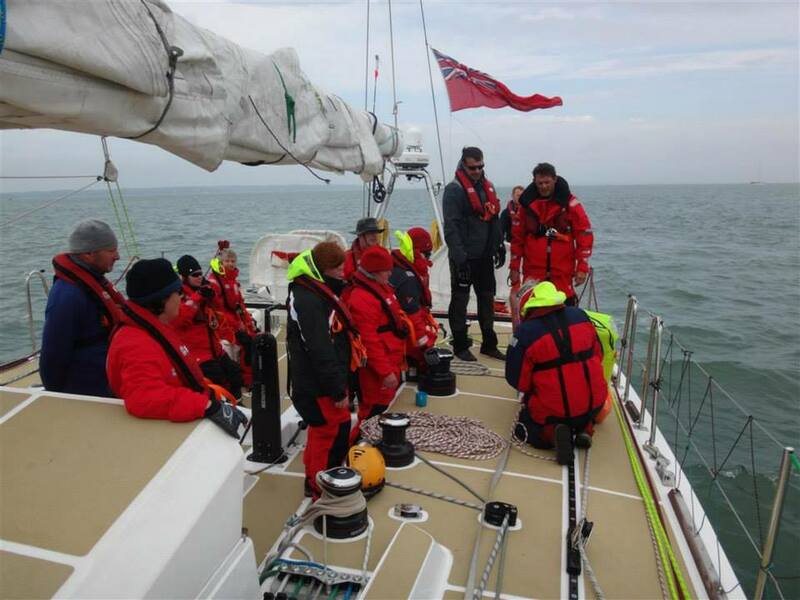 This is the first of the “Level Four” training sessions, where we are paired with our race skipper and crew – as is all of the participants on the training this week. Knowing how many people were going to be on training, I arrived at the car park at 8.15am to get the last car parking space. I knew it was going to be a bit tight, and didn’t fancy parking somewhere else and dragging my new Henri Lloyd case half way across Gosport. First stop after getting the gear on the boat (still CV25 as we have no sponsor announced at this time) was to go to the store to pick up our foul weather gear. It seems that we are sharing our boat with Team Daniel, as neither of us had a full crew this week. 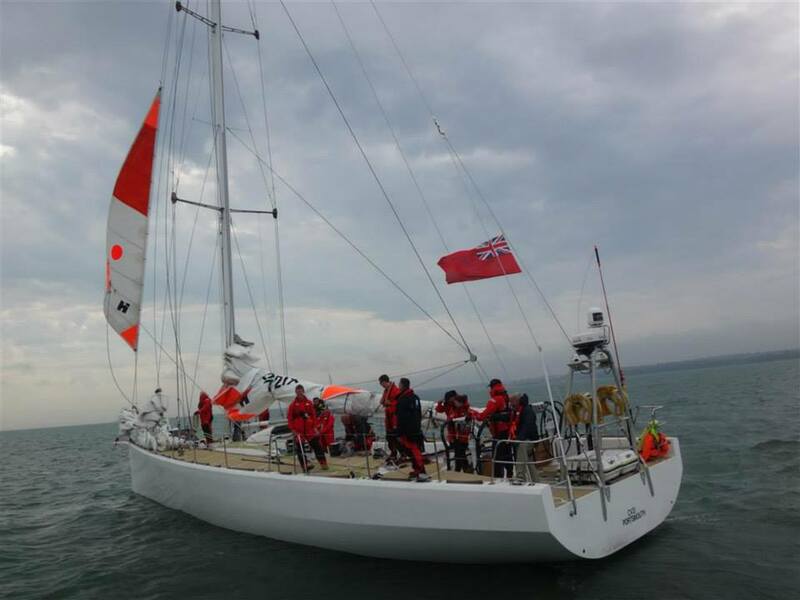 Both have nine crew members, so a total of two skippers and eighteen crew. I walk up to the store with Jan from Team Daniel, funnily enough who I was standing in the queue with at the Crew Day in January when we were trying on the foul weather gear for size. After a short wait, we are issued with our gear. She has been issued with the Ladies sizes – a big debate here as they are a different style, and both of us decided to go for the Male variety. She had to go and try it on, as they were not having it that she ordered the men’s. She gives in and keeps the ladies – I told her not to, but she couldn’t be bothered to keep arguing. She had a quick look at mine and told me I had been issued with ladies too – hadn’t got my glasses so good job she was there. Off I went back – and swapped them with no problem at all. I would not have liked to have gone to put them on for the first time and found that they were not what I ordered. We got back to the boat, and I managed to get the last lower bunk. Not sure what I am going to do if I am allocated an upper one on the race! The bag fitted neatly between the tank under the bunk and the bunk, and the dry bags with my spare set of clothes in one of the cave lockers at the side. All good so far! After both sets of teams had a refresher on safety both upstairs and down, we got the boat ready to set off at 2pm. 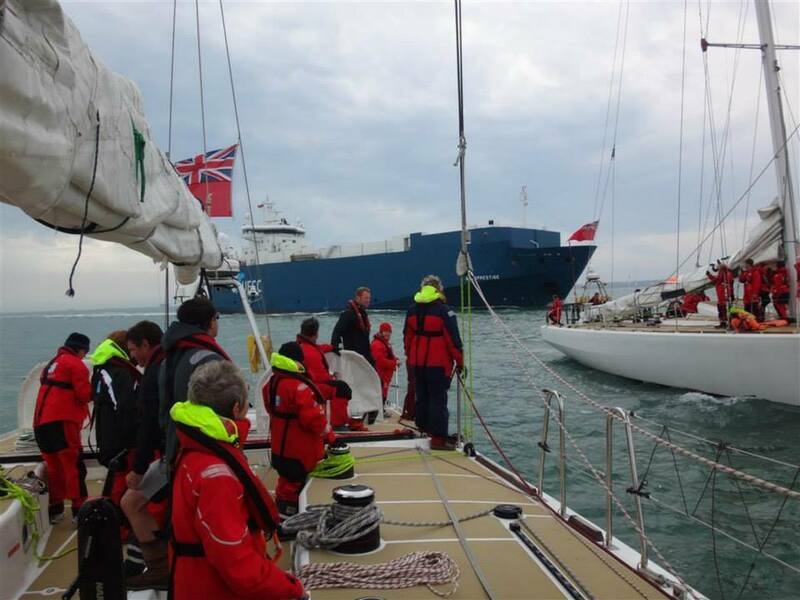 It was going to be a “Race Start” procession to leave the marina – with each boat leaving at three minute intervals. Apparently, the boats go on the dot whether you are on it or not – both here and at every race start. There were seven boats going out in all – five other crews were also sharing as only two had enough crew to fill one boat. It was a beautiful sunny day, and really lovely to see all of the boats going out one after the other. We did a few manoeuvres to remind everyone of how things worked, and to get used to our fellow crew mates. At this point we are all working together, and not on a watch system. The wind got up a little, and I had another cup of coffee where the liquid is like a little whirlpool in the cup. It was an international crew again – on Wendy’s team there was a New Zealander, three Australians, one Columbian and four from the UK. On Dan’s crew there was one Russian, three Irish, one Scots and four from the UK. We anchored around 9pm and then had dinner. There wasn’t quite enough bunks for everyone, and as everyone was having a full night’s sleep tonight I think the sail locker might be in use! We pulled lots for the anchor watch – just one hour each, but not good if you have to sleep, get up, and then go back to sleep again.